In this distribution system project, Con Edison is deploying smart grid components and systems to improve distribution system operations and planning. The goals of the project are to improve distribution system reliability, power quality, and efficiency. Other goals include deferral of investments in distribution capacity and reduction in O&M costs. Deployed equipment includes distribution automation devices such as automatic switches, capacitor automation devices, and feeder and substation monitors. The project scope includes 690 out of 2513 circuits. 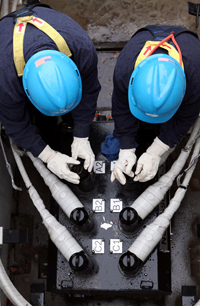 Con Edison will also integrate supervisory control and data acquisition (SCADA) and distribution automation systems. The enhancements will enable improved distribution system control and reliability. The total budget for this project is more than $272 million, including a federal share of more than $136 million. The project is a Smart Grid Investment Grant as part of the 2009 American Recovery and Reinvestment Act (ARRA). A key partner is Orange and Rockland Utilities, Inc.